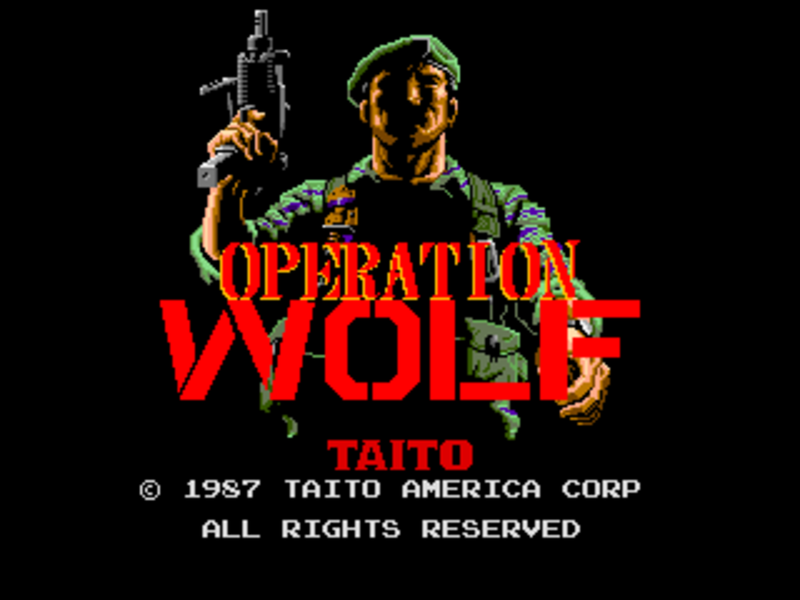 Operation Wolf was an arcade game released by software giants Taito in 1987. 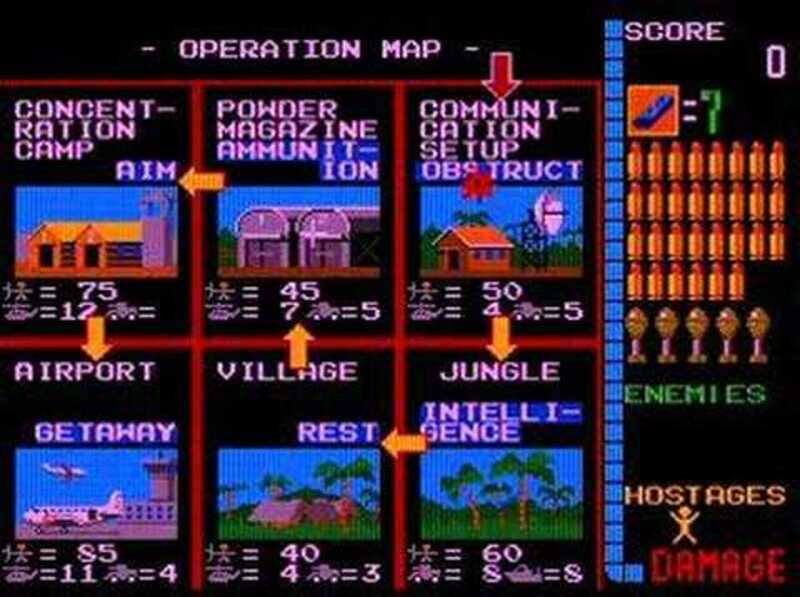 It was a game that had a unique and different control method (the same was said about Paperboy with it's handle-bar player controls) in the fact that it was fitted with a cabinet mounted uzi sub-machine gun for the player to use! This game with it's '3D' graphics, force feedback uzi, stereo sound, digitized speech and military beat soundtrack was a massive hit and an absolute must play game when it was released. 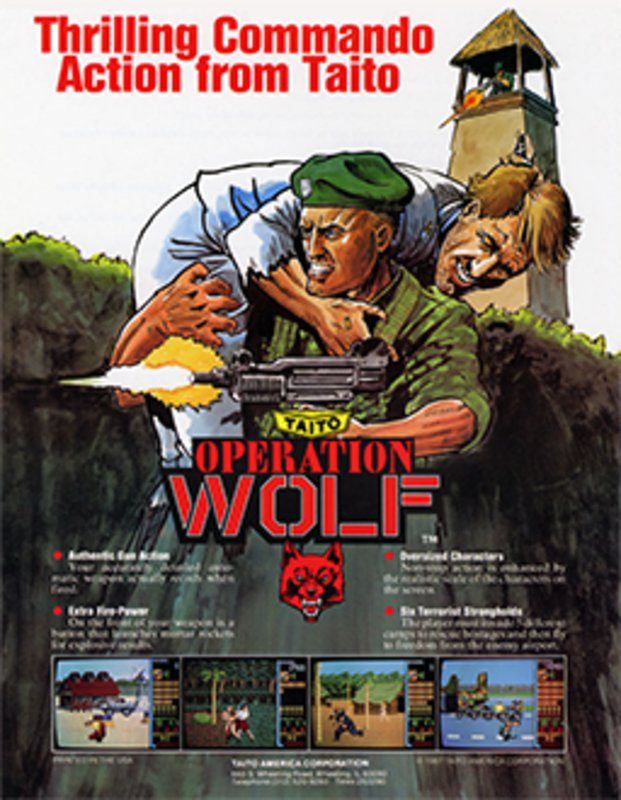 Operation Wolf was a one player game where the human took the part of a crack commando who had to rescue a bunch of hostages from a concentration camp. Each stage was populated with a large number of enemy soldiers, armoured cars and helicopters. There were also civilians running around and the odd animal such as pigs and chickens, shooting an animal would usually reveal a power-up of some kind, and shooting a civilian would reduce your overall health metre. The player had to play the game one stage at a time, meaning once a stage had been beaten it was onto the next stage. Each stage allowed the in-game story to unfold a little. For example, when the 'Jungle stage' had been beaten an enemy leader was interrogated and the location of the enemy concentration camp was 'sweated out of him'. These touches added a little weight to the game making more than a bog-standard pseudo shooter. Operation Wolf. You Are Finished... Here. 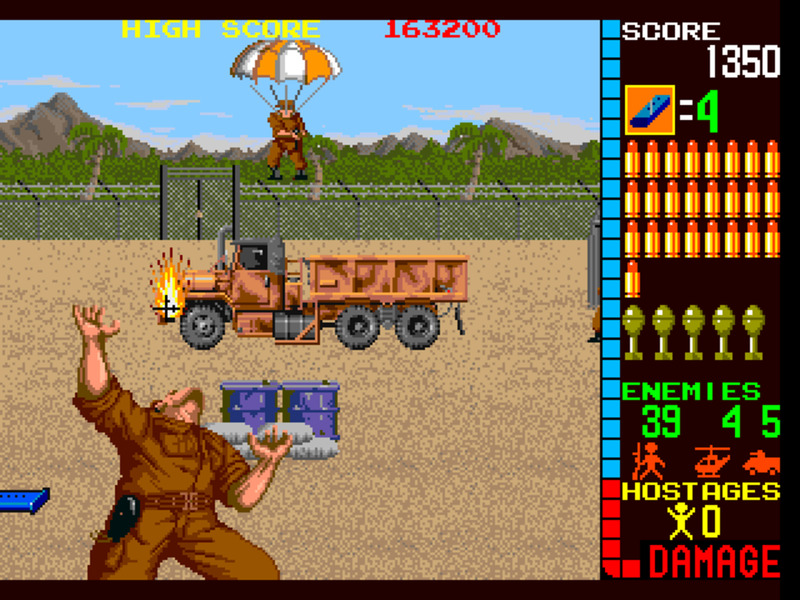 As previously stated the game was controlled with a cabinet mounted uzi machine gun that was capable of both swivel and elevation. It also came complete a trigger for the player to fire bullets (which activated a recoil action via force-feedback) and a side 'fire button' which fired a grenade. To complete each stage, the player had to take out all of the soldiers, armoured cars, jeeps, helicopters, and boats (depending on the current stage) that were present. Once all were taken out the level was complete and the overall 'story' would advance. Enemy soldiers would obviously shoot at you, but they also were equipped with other methods of attack. Some of them would throw hand grenades or knives towards you, and the vehicles would launch rockets in your direction. With a limited supply of machine gun ammunition and grenades you had to sometime pick your targets carefully. It was possible to gain extra ammunition by shooting barrels and crates or by shooting animals such as chickens and pigs. A fantastic power-up was the rapid-fire machine gun which allowed the player to wreak havoc with unlimited ammo at an increased rate of fire for ten seconds. This was great for destroying the enemy vehicles quickly without using your precious grenades. In classic arcade fashion the players health was displayed via a 'damage bar' that increased with each hit incurred. This also increased if a civilian or hostage was shot accidentally; this made careful shot selection yet more important. 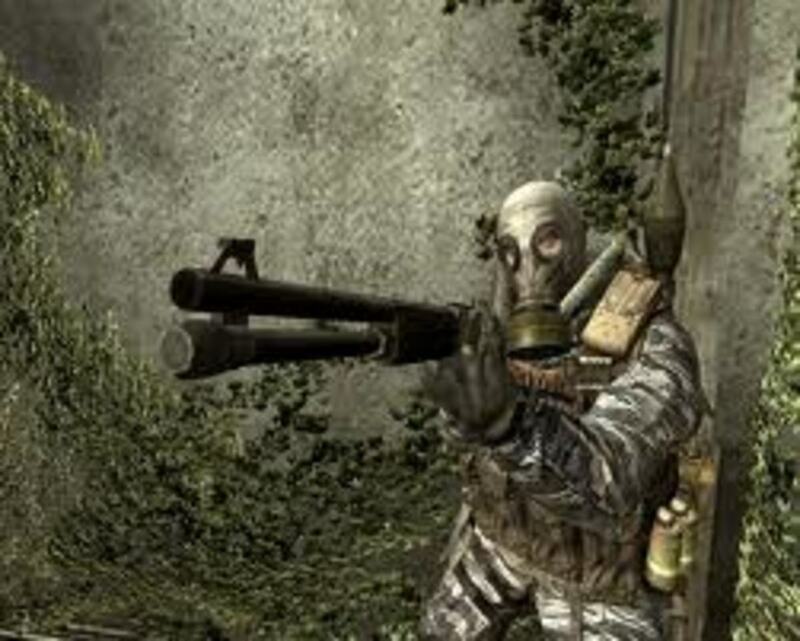 Health kits would appear now and again which could be shot to restore five points of health; the player had to prevent the bar from reaching it's maximum value to remain in the game. 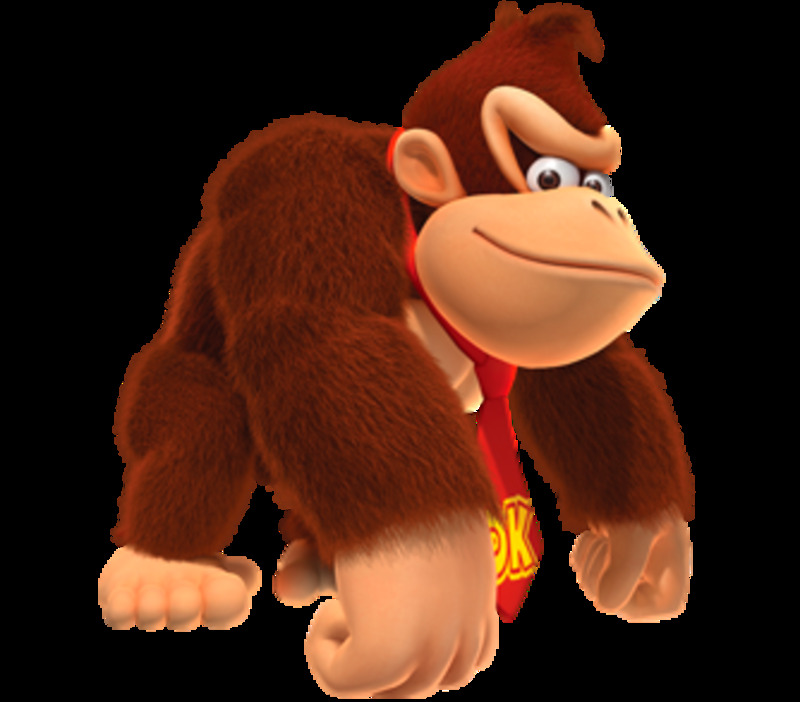 As the player advanced through the stages the enemies became more varied and tougher to kill. Some enemy soldiers were equipped with bullet proof jackets and had could only be dispatched with a head-shot. Others would pop up right in front of you and some would appear 'downwards' from the top of the screen. The final level tasked you with covering the hostages as they made their way onto a cargo plane - once all hostages were safely on board it was the final 'giant helicopter boss' fight between you and victory. 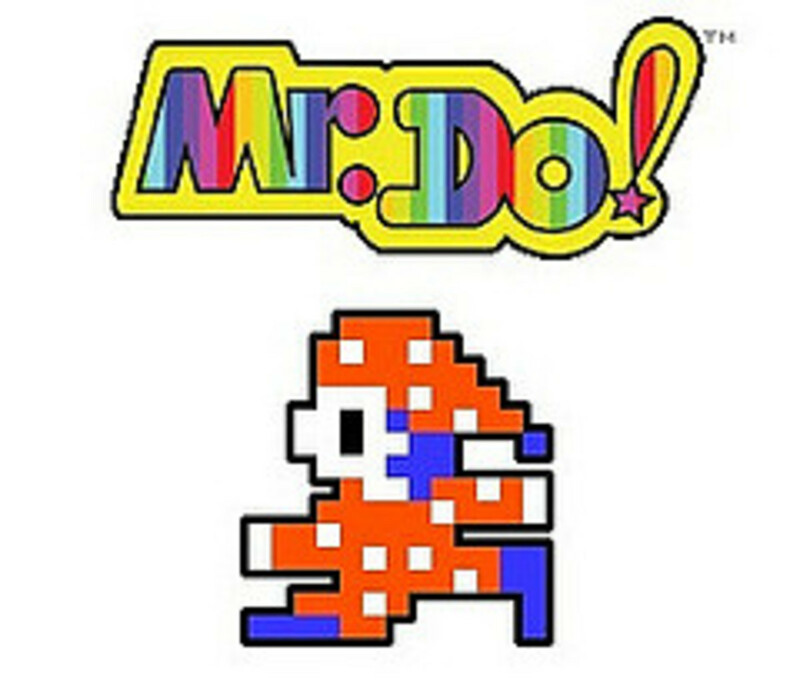 This game was so popular it was inevitable that it would be converted to other game consoles and computers of the era. Home computers such as the ultra popular Commodore 64 and ZX Spectrum were treated to their own (and pretty good considering the hardware) conversions of the game. I found that the ZX Spectrum Operation Wolf monochrome graphics actually worked very well and for an 8-bit version it did play very nicely indeed. 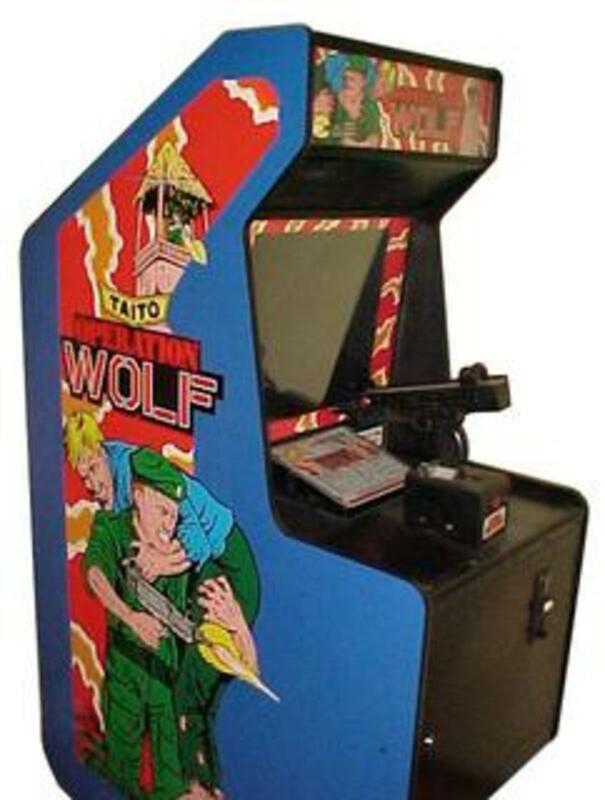 The Amiga Operation Wolf was also very playable and managed to match the arcade machine in both sound and visuals quite accurately, due to the extra capabilities of the 16-bit machine. The conversions to the NES, Master System and ZX Spectrum featured light-gun support too which was all part of the appeal of the game. Other machines such as the Amstrad CPC 464 were treated to a reasonable conversion, and the game also made it's way onto DOS for PC Gamers. All in all this is a true classic arcade game from the latter part of the 1980s. It really was a pulse pounding experience with gaming elements that combined perfectly for the ultimate blasting experience. That's it. I am finished. Here. Games to make you chuckle! Modern Warfare 3: Best Guns and Classes for the Kill Confirmed Game Mode! 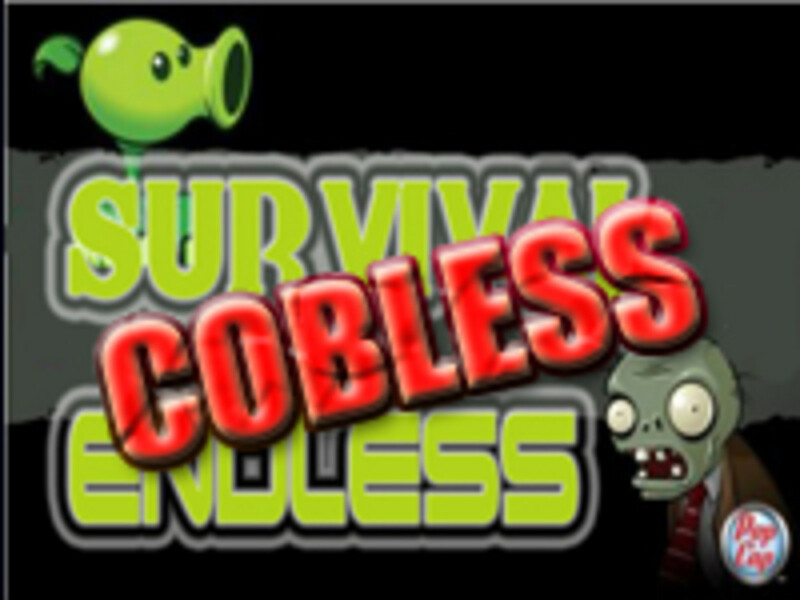 Anyone Else Love This Classic Game? Very enjoyable shooter; always fun rapid fire combat. The NES version was OK too. 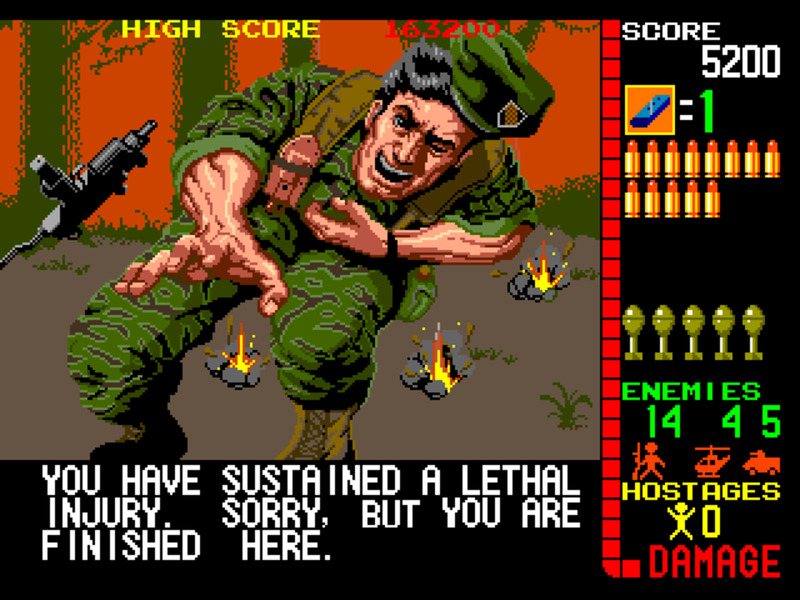 Rambo 3 on the Sega Master used a similar formula; fun time there as well.